Each submission is peer-reviewed by a volunteer staff of student readers from the Honors College as well as faculty and staff from the Honors College. Papers are judged on the basis of their clarity, originality, organization and argumentative qualities. Having your work published in Lucerna is a great achievement for any undergraduate looking to further her or his education or to begin a professional career. The 2018-2019 Lucerna Faculty Advisor is Dr. Henrietta Rix Wood, Honors College Associate Teaching Professor. For more information, please contact the Editor-in-Chief Anthony Gilyard. We are currently accepting submissions. See the Lucerna 2018-2019 Guidelines for information about submitting your undergraduate research paper for consideration. Every year Lucerna celebrates its annual publication with the Lucerna Symposium. 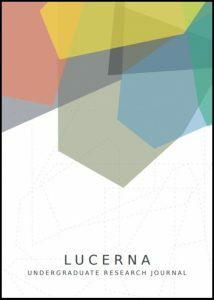 The Lucerna Symposium allows authors of the newest volume to present their research to the UMKC and Kansas City community. The UMKC Writing Studio, located on the second floor of the Atterbury Student Success Center, is an invaluable resource for student writers. The center offers one-on-one consultations that will help you develop and organize your research paper. No matter what field of study you may be in, the Writing Studio staff is equipped to help polish and improve your work. Visit Writing Studio Student Services to make an appointment for an onsite session or an online session (via email or Skype), if it better suits your schedule.